Weather the Storm Lyric Video! Mi$ Debuting New Tracks Off “Kill Your Past!” TONIGHT on FM949! Monkeys In Space will be LIVE on FM94.9 to debut never before heard music off of the anticipated Tuesday release “Kill Your Past!” Don’t miss this!! ** Listen in for the magic word- when heard head over towww.facebook.com/monkeysinspace and post the word on our wall…Everyone who participates will receive a FREE Flying Under the Influence T Shirt and EP shipped to your door! Tune in around 8pm to Tim Pyles FM 94/9 show- we are on towards the second half so be sure and keep the dial in place! ** To participate in the giveaway please click on the tab that has a picture of a PLAY button on it and is titled “Band Profile, Submit your email address to the “Join Mailing List” button and we will contact you to obtain your address for your free Mi$ gear! Definitely working overtime on the new record right about now, Kill Your Past-Pushing to hit next Tuesdays release date with all I got in me! The first single off of the new record, “My Drinking Buddies Have a Rock & Roll Problem..” is now available for FREE DOWNLOAD for a limited time through the release of the album.. Get- Get- IT and give it to all of your friends! Much love and stay tuned for tons of killer Monkeys In Space news and happenings coming up soon! Stoked to have one of the founding members rejoin Monkeys In Space- welcome back Ryan Higginson.. We kept your seat warm for ya buddy. 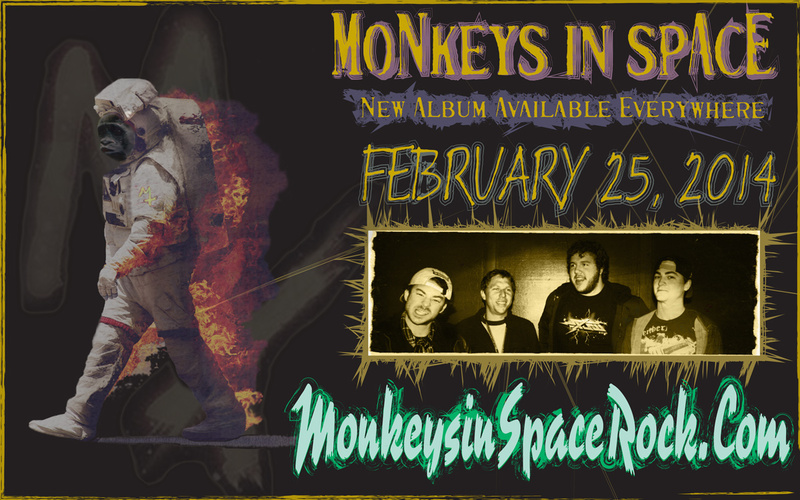 The original Monkeys in Space line up is fully restored just in time for the new album, “Kill Your Past” release. Stay tuned for an announcement of some HUGE shows in May! Awwww yeaaaa it’s good to be a Monkey! Its OFFICIAL- Monkeys In Space Name New Album! Its OFFICIAL! The name of the upcoming Monkeys In Space full length album has finally been announced.. As this record has morphed into a nostalgic blend of old bangers and an all grown up touch of new… so much… be it good or bad, has happened between now and our last release- Flying Under the Influence. We feel we have truly grown as individuals, as musicians and as a band.. for better or for worse is still up for debate. We can all agree that the chance of a better life can always be found in the ever so changing future we will soon enough realize. With this- we feel “Kill Your Past” as it has been officially named, best represents all the euphoric times and the ugly in addition to that constant drive to improve upon ones self. “Kill Your Past” can be taken in both the figurative and literal sense as we have realized it is a necessary thing to leave your past behind if you are ever to grow and fully embrace this constantly evolving space within which we occupy.. and for some (myself included) this can be a most difficult thing.. At any point on any given day you might find yourself coming face to face with a previous version of yourself, be it bumping into old friends, having dinner with your over critical parents.. walking away from that same old argument with your significant other.. could you Kill Your Past- To Save Your Future? Monkeys In Space finally announce the title of their upcoming 2014 release and give a little bit of insight into how this record found its name. Get ready Monkeys the new album “Kill Your Past” is right around the corner! New Mi$ Album Release POSTPONED! Well- I will spare you guys the long drawn out explanation of why yesterday, February 25th, 2014, the official scheduled release day for the new album… came.. and went.. with no album drop from us.. I assure you- in a round about way- this is a good thing! Basically the skinny of it is we started tracking a set number of tracks for the new album.. But during the recording process we decided to add a and older song remake here.. and wrote a brand new banger there…. and welp- before you know it we were working on the better part of 18 songs.. Needless to say we stretched ourselves a bit too far and need to account for some more mixing time if we want to release as many songs as we have decided to. So sit tight! The new album has been pushed exactly one month and the new release date is now Tuesday- March 25, 2014.. a date I assure you we will hit without a hitch! 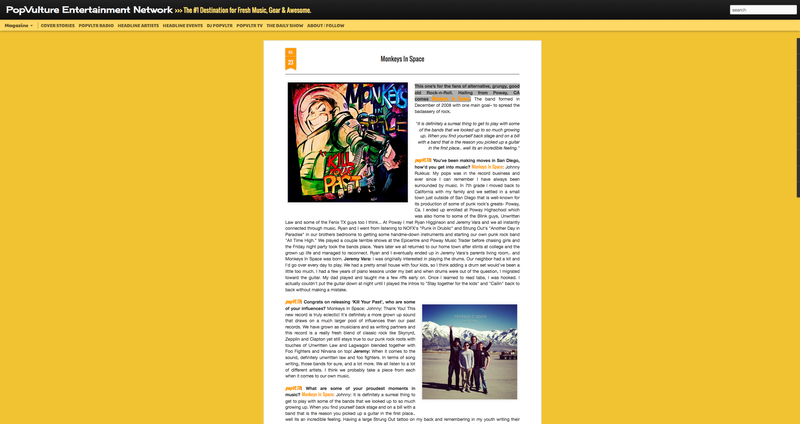 Keep coming back here, our newly revived blog site, for more updates- we will be posting regularly and have some killer sneak peaks coming your way! Much Love Monkeys.. We will be touchin down soon- until then: Rukk.. Signing Off.